Institute midfielder Aaron Harkin fired home from 25 yards. Institute returned to their old self with this hard fought and deserved win at fellow promotion hopefuls Ballyclare Comrades. A super man of the match display by Michael McCrudden ensured Paddy McLaughlin's side got back to winning ways, at a rain soaked Dixon Park. The Gobnascale man netted two fantastic goals, but it was his all round work-rate up top, throughout the game, was the bench mark for the rest of his team-mates. 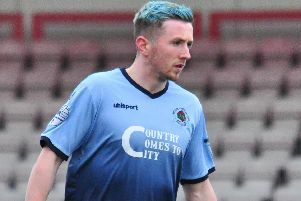 Ballyclare made a host of changes to their team, which lost at Portadown last weekend, with Chris Rodgers, Thomas Robinson, Gary Brown and Stewart Nixon all not making the squad. As for the visitors they made two changes to their side which lost narrowly to Newry City, with Jamie Dunne and Stephen Curry both starting, as Gareth Brown and Ronan Wilson dropped to the bench. Institute had a glorious chance to take a seventh minute lead as Michael McQuitty's header back to his goalkeeper only found Stephen Curry, but the winger's attempted lob over Paddy Flood sailed just over the bar. The Waterside men continued to press forward on the front foot with Mark Scoltock and Aaron Jarvis both having efforts, which Flood saved comfortable. On 15 minutes a Aaron Harkin in swinging free-kick from the left found Niall Grace totally unmarked, but the big midfielder failed to test Flood and headed over from close range. Institute deservedly went in front in superb fashion on 21 minutes as Eamonn Seydak broke clear down the left before cutting inside and laying the ball off of Harkin, who made no mistake from the edge of the box, firing low past Flood. Six minutes later the visitors doubled their lead thanks to another top draw goal this time from skipper McCrudden. The striker skipped away from a few challenges some 25 yards from goal before his stinging drive flew past Flood. Comrades first real good piece of play in 'Stute's half came just after the half hour mark but Eoin Kane's strike from 10 yards was deflected just wide by Jarvis. As the half-time whistle sounded the visitors will have felt they should have been further ahead as Grace on a few occasions saw his close range headers saved by Flood. The home side pulled a goal back on 48 minutes in rather fortunate circumstances as Matty Parker's right wing free-kick was headed into his own net by the 'Stute defender Dean Curry. Within a minute the woodwork came to the 'Stute's rescue as Curtis Woods' strike, which had Marty Gallagher beaten, rattled the post and Ryan Morrow did well to block Samuel McIlveen's follow up strike. After what was a shaky start to the second half for the visitors, they increased their lead on 53 minutes as Stephen Curry broke the offside trap and he showed great composure to lift the ball over Flood. Comrades had a good chance to pull a second back just after the hour mark, but Adam McCart was unable to keep his effort down at the near post. The home side were awarded a penalty on 68 minutes but Parker's resulting effort from 12 yards was kept out by Gallagher, who dived to his left to parry the ball away. Referee Shane Andrews was in the thick of things again on 78 minutes as he over ruled his assistant and let Mark Kelly's goal stand, despite his assistant having the flag up for offside, 'Stute's protests fell on deaf hears and the game eventually restarted. To their credit the visitors netted a fourth a minute later as more good play and skill by McCrudden saw him get away from the home side's defence before drilling the ball home past Flood. Ballyclare Comrades: Flood, Woods, Parker, McQuitty, Youle, McCart, McIlveen, Dobbin, Middleton, Kane, Kelly. Institute: Gallagher, R Morrow, Scoltock, D Curry, Seydak; Jarvis, Grace, Harkin; S Curry (Wilson 76), McCrudden (Boyle 88), Dunne (Brown 52).